Elliot is almost three months old now. 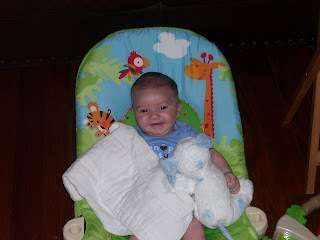 And last night, he hit a big milestone - he slept through the night! Maybe not such a milestone for him as it is for Robin and I, because we might actually get decent sleep now. Anyway, here's a picture of the little bugger. Ain't he cute? Floyd, I could not be happier for you and the missus. Baby E is adorable and I wish I were around to meet him.